Though viral load testing is a powerful tool, recommended by the World Health Organization (WHO) for improving the long-term success of antiretroviral treatment (ART) for HIV, less than 20% of ART patients in Africa receive regular viral load monitoring. At the AIDS 2014 International Conference in Melbourne, Australia, in partnership with UNAIDS, ASLM helped to launch the Diagnostics Access Initiative, which, through plans for improved laboratory capacity, specifically set the aim of ensuring that 90% of all people living with HIV know their HIV status, that 90% of those diagnosed with HIV receive sustained antiretroviral therapy, and that 90% of all people receiving antiretroviral therapy have achieved lasting viral suppression. The assertion is that these goals can be made possible, in part, through regular viral load testing. As a step to set priorities for increasing access to HIV viral load testing, in April 2013 ASLM hosted the Expert Consultation on Viral Load Monitoring in African HIV Treatment Programmes in Cape Town, South Africa, in partnership with the WHO Regional Office for Africa, UNAIDS, the Society for AIDS in Africa, and the Southern African HIV Clinicians Society. Participants established priorities for providing clear guidance on WHO guidelines, by which the Viral Load Monitoring in African HIV Treatment Programmes report was generated (please visit: www.aslm.org/viralload). Recently, ASLM, in partnership with WHO, the Global Fund, the Clinton Health Access Initiative (CHAI), the US President’s Emergency Plan for AIDS Relief (PEPFAR), and Cheikh Anta Diop University hosted a workshop to actualise the priorities previously set forth. 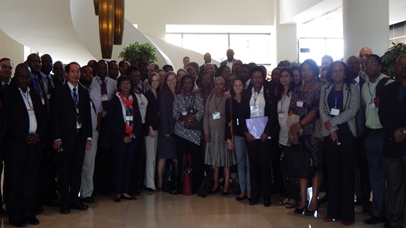 In Addis Ababa, Ethiopia from 15-17 September, participants assembled to develop country-specific plans for implementing the expansion and enhancement of viral load testing using a network model. Regional HIV treatment providers, laboratory scientists, Ministries of Health, policy makers, programme managers and implementing agencies attended the workshop and heard presentations from field experts on subjects such as: maximising efficiency of viral load testing on the structural level; improving patient care; the experiences of Uganda and South Africa in crafting strategies for expanding access to viral load testing; sample transport; WHO guidelines; and measuring the impact of strategy implementation. Participants also identified the crucial components of a sustainable viral load programme and the essential tools to be developed and shared, such as a monitoring and evaluation framework, cost frameworks, training for clinicians and nurses, and guidelines for referral systems. Each day, after the presentations, the participants broke into groups to discuss and formulate country-specific plans, and later presented them to the workshop as a whole. At the conclusion of the workshop, participants left with a clearer sense of the technology and resources available to expand access to viral load testing programmes, and more specifically developed strategies for eventually achieving the UNAIDS 90-90-90 goals. Originally published in the November 2014 issue of Lab Culture newsletter.